On a walk with Reggie this week we encountered a woman about my age with a young looking Yellow Labrador. She asked me if they could meet. Hurrah! This hardly ever happens; usually I am the one that asks if the dogs can meet. Or my pet peeve (ha) the other dog has already charged Reggie whilst the owner is saying “he/she is friendly, is yours?” (what if I said NO?). On this day it was the latter. It was instant growling, and darting in and back at the other dog. I was holding Reggie back when the other woman said, “oh, he just wants to play. Look both their tails are wagging.” I looked and Reggie’s tail was wagging. But, do wagging tails always mean happiness, playfulness? You have to consider the position of the tail as a sort of emotional barometer as well as the wag. A middle position relaxed tail is a relaxed dog. A horizontal tail is alert and attentive (think Pointers). A high tail is dominant or threatening. A low tail, or tucked under the body, is fear, anxiety, and stress. These are all relative to the normal position of your dog’s tail. A Greyhound will normally have a low tail and Chow will normally have a high tail curled over its back. 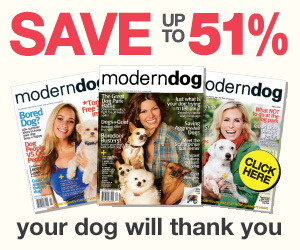 Know your dog’s normal. A slight wag of a relaxed tail is seen as tentative but generally friendly (“I’m here”). A broad sweeping wag of a relaxed tail is the non-threatening wag, the “I’m happy you’re home wag,” especially if the hips wag with it. A slow wag with a low tail signals insecurity. Tiny, high-speed movements with the tail in any position usually mean the dog is about to do something- like run or bite. If the tail is in a high position with short rapid movements, this should be taken as an active threat. 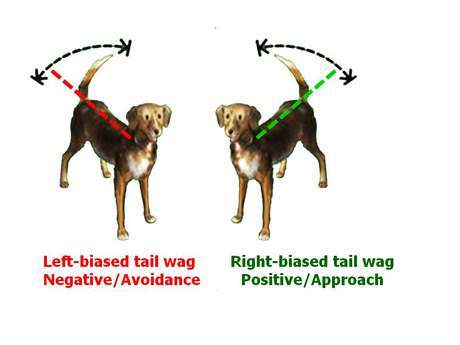 A bit of useless trivia (or not so useless) in recent studies when dogs saw their owners their tails wagged more to the right. When faced with an aggressive dog their tails wagged with a bias to the left. In hindsight, I don’t remember how Reggie’s tail was wagging. It wasn’t an extreme; a very high tail or very low tail. But he certainly wasn’t relaxed. Did he have a sort of low tail with short rapid wags because he felt stressed or threatened by the playful but charging dog? I’ll be sure to pay attention for that from now on. And I’ll keep trying to keep Reggie calm and not be an energy mirror and greet other dogs in normal way (sniff, sniff…)!